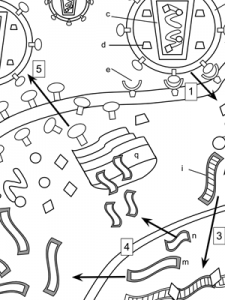 HIV coloring worksheet uses a model to understand viral transmission. Students identify and color the major structures related to HIV transmission and replication. Students color each structure and answer questions related to the model. Finally, students are asked to create their own model of how a DNA virus would infect a cell and replicate. The worksheet also provides information about how anti-viral drugs interfere with different stages of viral infection. For example, some drugs can prevent the attachment of the virus to the cell, and other drugs might prevent transcription from occurring.